Blinds is a concept that is relatively new to India and going by the potential and recent growth graphs for this sector, the players are few. While some industry experts see window blinds as a substitute for curtains or window films, other feel it is an addition, a new category in window dressing that is trendy, and becoming fashionable by the day. The first window blinds in India were introduced about 40 years back by brands like Vista and Mac. It was the usual Venetian blinds, which are now out of fashion. The horizontal blinds were made of aluminium initially. Vertical blinds, which are joined from just one cord and are economical, came 30 years back. In earlier days, blinds were made of wood and glass. Wood and aluminium still continue, but glass is no longer used. Worldwide, blinds were introduced 60-70 years back. Fabric blinds came to India 20 years back. Mac was the dominant player then. Hunter Douglas, the famous European brand entered Indian market with similar products 5 years later. The second generation blinds came in India 10-12 years back – the Roller and Roman blinds – following large scale demand from IT companies who were environment conscious and wanted to save on energy with blinds. These could regulate sunlight as per the requirement. It is estimated that about 3 years back the Indian market for blinds was worth over Rs.200-300 crore and conservatively speaking, the growth in residential has been 20-25% per annum while in commercial the pace of growth was 10%. The total blind market as of 2015 is therefore estimated at about Rs.500 crore. And the market will certainly grow rapidly from here. Viewed against the potential, it is estimated that blinds have reached less than 1% of the windows in India,. “But I am sure it will grow very fast because in USA too, it was a similar situation 10 years back.Today 50% of the windows have curtain and remaining 50% have the blinds. So, after 8-10 years, in India too it should be 50-50,” says Ashok Paun, Managing Director of Accumax Interiors (Marvel). 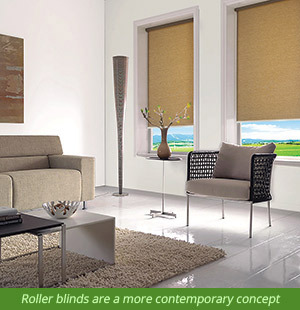 Seen I this context, “the Indian market for blinds should be around Rs.5000 crore over the next 5 years and if the growth is 25% this year it will be 30% next year, 35% thereafter, and so on,” according to Hemant Bhide of Louver line. Share of international brands like Forest and Hunter Douglas put together is said to be less than 10% of the Indian market. The global market share of these brands is reported to be Rs.6,000 crore for Hunter Douglas alone of which India contributes very little yet, according to market watchers. “Earlier there were only three type of blinds Roller, Vertical and Venetian, which was generally (wooden. They were easy to make. Share of business of these 3 blinds currently is about 60-70% but it is reducing day by day,” explains Ashok Paun, whose brand Marvel has been constantly innovating in this category. Now there are 12 types of blinds, these are technically sophisticated so can’t be as easily replicated. The new variations include Shutters, Panel Blinds, Roman Blinds, Sheer Horizon Blinds, Duplex Blinds, and so on. “Even now in India there is little awareness of blinds. One reason is, companies that initially introduced this product in India’s residential sector fixed prohibitive prices due to which the product got completely neglected in the residential market,” says Hemant Bhide. While some industry experts place the share of branded and unbranded at 50% – 50% each, Hemant prefers to divide the market between national branded players, global branded players and pan India unbranded suppliers. “I think about 31% of the market is with national brands, about 17% with international brands and remaining 52-53% is catered to by unbranded market,” he adds. Asked about market share of his brand Marvel, Ashok says “Marvel is a market leader in India with 40% share in the branded segment. In the South we are No.1 and in west we are at No. 2, the reason being that Marvel is very innovative.We innovate and update regularly,” he asserts. 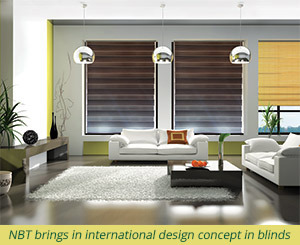 Growth in the demand for blinds in India was triggered primarily by the IT Companies some 10-15 years back. They required huge complexes and needed to save on energy usage by regulating the flow of sunlight in a most optimum way. Blinds were the best and most effective option. Majority application in IT companies is of Roller blinds because it is very easy system to restore. In the institutional or commercial sector the two popular applications are the Vertical blind and the Roller blinds. Residential sector has started picking up hardly 3-4 years back. Ashok Paun says in some varieties blinds are cheaper then curtain. “Latest innovation in blinds look much like curtain but function like blinds. The printed blinds look same as curtain. Blinds can be customised, the way you want it. Marvel commits dispatch within 48 hours and installation within 4-5 days” he explains. Blinds basically have 2 major components, one is the mechanism and second is the fabric. Both are equally important. 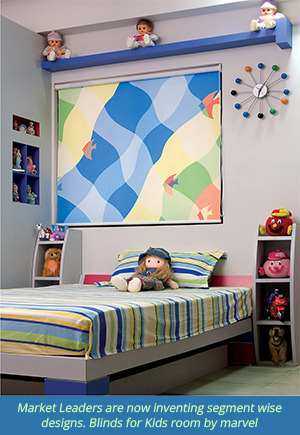 Today, the price of blinds vary from Rs.100 to Rs.1000 per sq. foot and major cost component in the blinds is it’s fabric. Only about 20-40% of the cost is of mechanical components and 80-60% goes in fabric. “Average price of Forest blinds are 25-30% higher than the local ones because of the import duties, which stand at 28% whereas in domestic production excise duty is only 12-14%,” says Sunil Parekh of A to Z, the sole distributor for Forest in India. Most of the blinds are imported from Europe or China. In the branded segment even the binds fabric is imported, about 90% of it. It is the reverse in the unbranded segment. Some companies have recently been set up in India to produce the fabric and components. 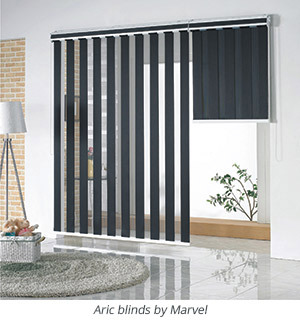 Overall the market is moving towards the quality branded blinds and there is huge margin in the business. Even if each of the branded players manage to get 1% of the Indian market share, it will be a great business proposition.